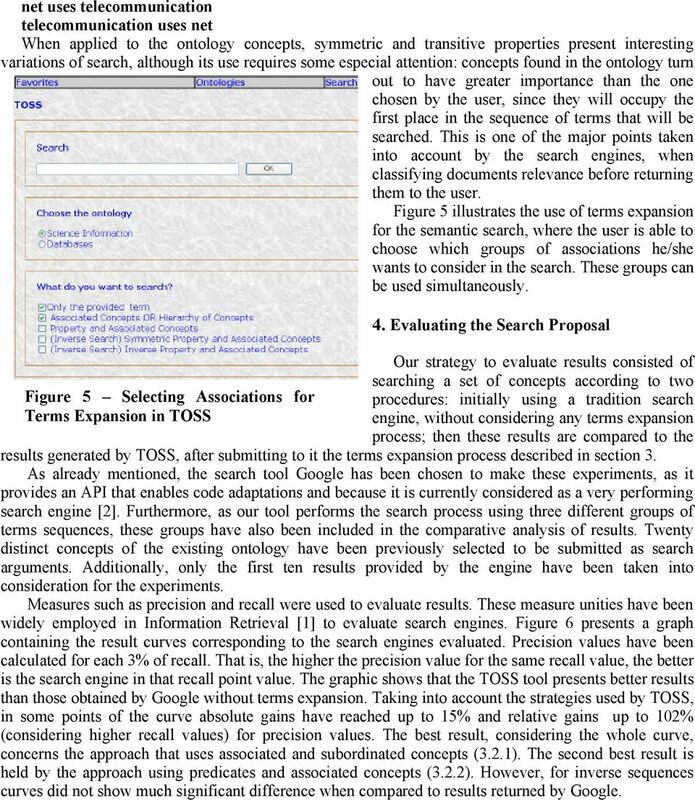 Download "Semantic Search in Portals using Ontologies"
2 performed by TOSS have been compared to those performed by a traditional search engine, such as Google, showing significant results. The remainder of this paper is organized as follows. 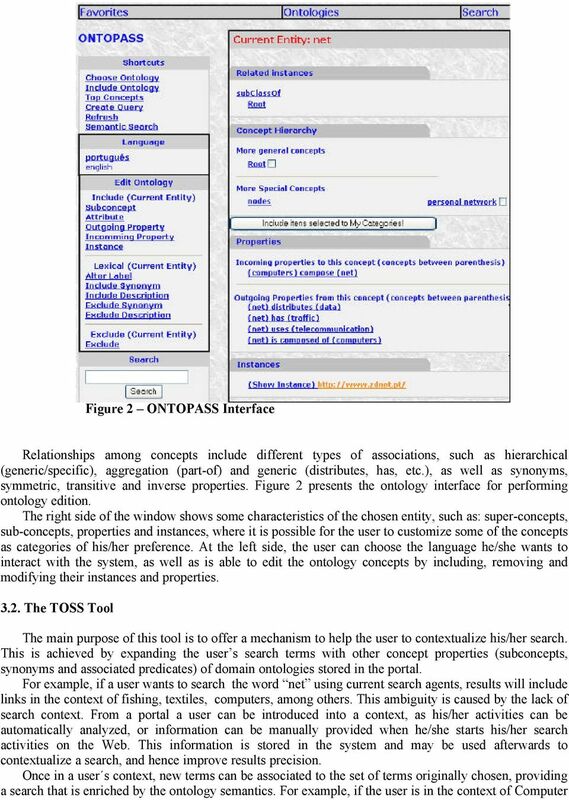 Section 2 gives a brief overview of semantic portals, and shows how ontologies can be inserted into these environments to improve search mechanism. 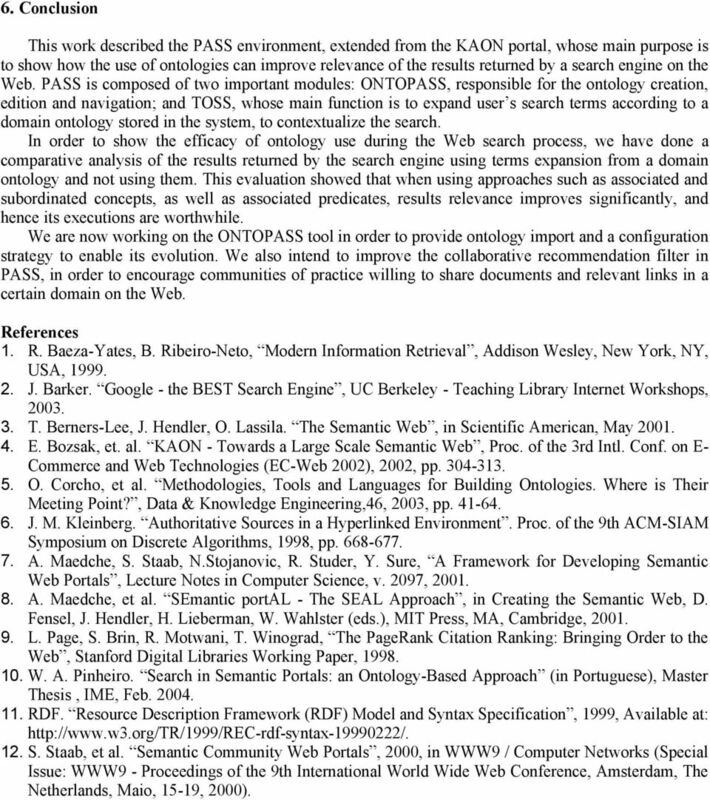 Section 3 presents PASS, the proposed semantic portal environment, focusing on its semantic search component named TOSS. It describes the main approaches used to accomplish searches using ontology knowledge. Section 4 evaluates the search results performed by TOSS. It shows how the strategies employed in the search engine can improve results relevance. Section comments some related work, and finally, section 6 concludes the paper with additional comments and future work. 2. Semantic Portals and Ontologies The attention of the computer science community has converged, due to the advent of the Web, towards the development of technologies that also enabled its use by machines, and not only focusing on humans. This new aim completely changed the way material should be published on the Web. It required standards and special mechanisms to represent semantic information content on the Web. Although still a challenge, researches progress towards the Semantic Web, such as envisioned by Berners-Lee . Ontologies are central in the vision of the Semantic Web, since they enable knowledge sharing, reuse and common understanding between agents (human or machine), by providing a consensual and formal conceptualization of a given domain. 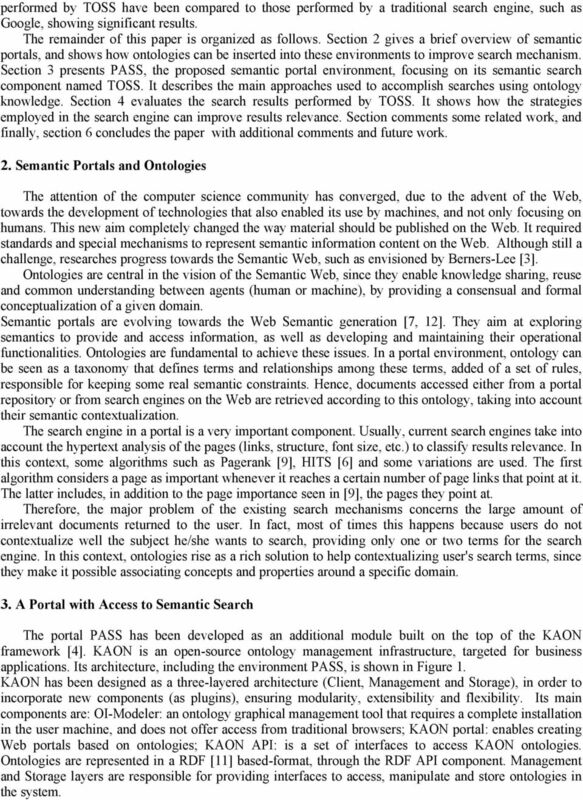 Semantic portals are evolving towards the Web Semantic generation [7, 12]. They aim at exploring semantics to provide and access information, as well as developing and maintaining their operational functionalities. Ontologies are fundamental to achieve these issues. In a portal environment, ontology can be seen as a taxonomy that defines terms and relationships among these terms, added of a set of rules, responsible for keeping some real semantic constraints. Hence, documents accessed either from a portal repository or from search engines on the Web are retrieved according to this ontology, taking into account their semantic contextualization. The search engine in a portal is a very important component. Usually, current search engines take into account the hypertext analysis of the pages (links, structure, font size, etc.) to classify results relevance. In this context, some algorithms such as Pagerank , HITS  and some variations are used. The first algorithm considers a page as important whenever it reaches a certain number of page links that point at it. The latter includes, in addition to the page importance seen in , the pages they point at. Therefore, the major problem of the existing search mechanisms concerns the large amount of irrelevant documents returned to the user. In fact, most of times this happens because users do not contextualize well the subject he/she wants to search, providing only one or two terms for the search engine. In this context, ontologies rise as a rich solution to help contextualizing user's search terms, since they make it possible associating concepts and properties around a specific domain. 3. A P o r t a l w i t h A c c e s s to Semantic Search The portal PASS has been developed as an additional module built on the top of the KAON framework . KAON is an open-source ontology management infrastructure, targeted for business applications. Its architecture, including the environment PASS, is shown in Figure 1. KAON has been designed as a three-layered architecture (Client, Management and Storage), in order to incorporate new components (as plugins), ensuring modularity, extensibility and flexibility. Its main components are: OI-Modeler: an ontology graphical management tool that requires a complete installation in the user machine, and does not offer access from traditional browsers; KAON portal: enables creating Web portals based on ontologies; KAON API: is a set of interfaces to access KAON ontologies. Ontologies are represented in a RDF  based-format, through the RDF API component. Management and Storage layers are responsible for providing interfaces to access, manipulate and store ontologies in the system. 7 net uses telecommunication telecommunication uses net When applied to the ontology concepts, symmetric and transitive properties present interesting variations of search, although its use requires some especial attention: concepts found in the ontology turn out to have greater importance than the one chosen by the user, since they will occupy the first place in the sequence of terms that will be searched. This is one of the major points taken into account by the search engines, when classifying documents relevance before returning them to the user. 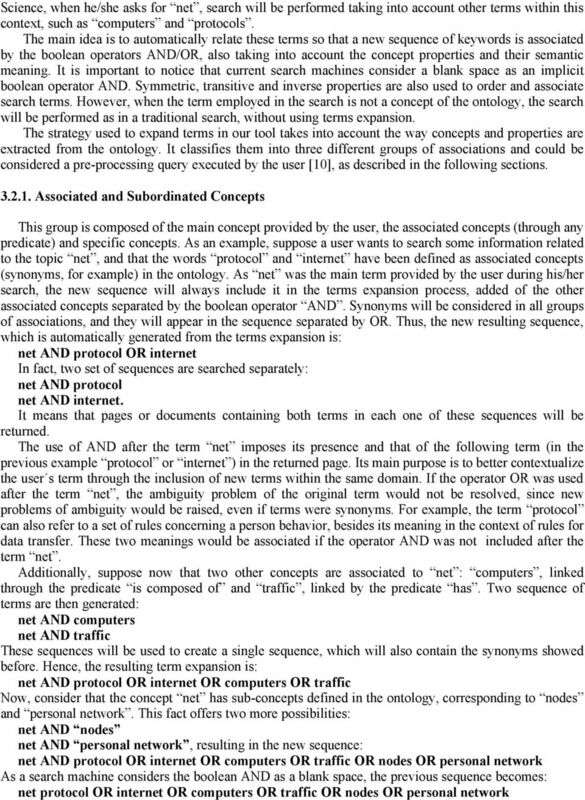 Figure 5 illustrates the use of terms expansion for the semantic search, where the user is able to choose which groups of associations he/she wants to consider in the search. These groups can be used simultaneously. F i g u r e 5 S e l e c t i n g A s s o c i a t i o n s f o r Terms Expansion in TOSS 4. Evaluating the Search Proposal Our strategy to evaluate results consisted of searching a set of concepts according to two procedures: initially using a tradition search engine, without considering any terms expansion process; then these results are compared to the results generated by TOSS, after submitting to it the terms expansion process described in section 3. As already mentioned, the search tool Google has been chosen to make these experiments, as it provides an API that enables code adaptations and because it is currently considered as a very performing search engine . Furthermore, as our tool performs the search process using three different groups of terms sequences, these groups have also been included in the comparative analysis of results. Twenty distinct concepts of the existing ontology have been previously selected to be submitted as search arguments. Additionally, only the first ten results provided by the engine have been taken into consideration for the experiments. Measures such as precision and recall were used to evaluate results. These measure unities have been widely employed in Information Retrieval  to evaluate search engines. 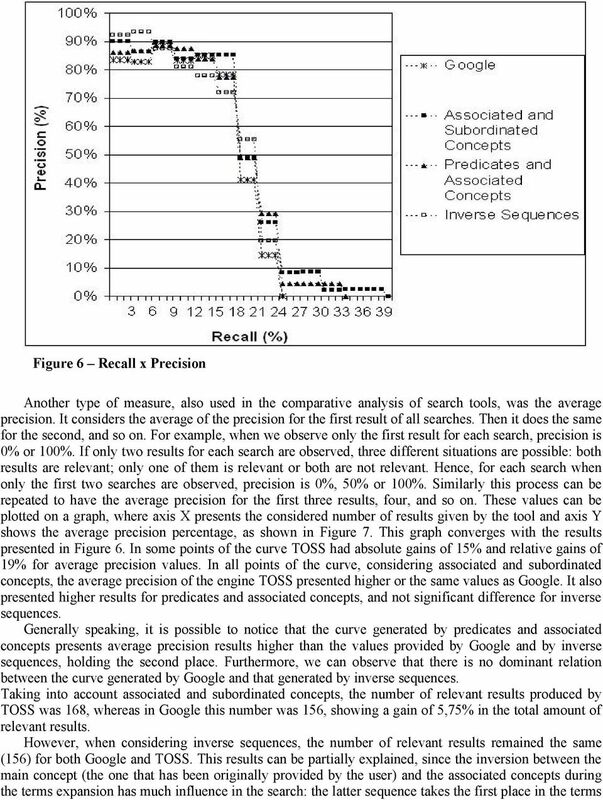 Figure 6 presents a graph containing the result curves corresponding to the search engines evaluated. Precision values have been calculated for each 3% of recall. That is, the higher the precision value for the same recall value, the better is the search engine in that recall point value. The graphic shows that the TOSS tool presents better results than those obtained by Google without terms expansion. Taking into account the strategies used by TOSS, in some points of the curve absolute gains have reached up to 15% and relative gains up to 102% (considering higher recall values) for precision values. The best result, considering the whole curve, concerns the approach that uses associated and subordinated concepts (3.2.1). The second best result is held by the approach using predicates and associated concepts (3.2.2). However, for inverse sequences curves did not show much significant difference when compared to results returned by Google. 9 sequence, assuming a higher priority for the search engine. Hence, tests showed that this inversion did not contribute much to improve the user s concept contextualization. Despite this fact, an interesting fact was observed concerning the diversity of the pages returned to the user. None of the searches performed by the inverse sequence presented duplicate results when compared to the original search submitted to Google (without terms expansion). In the other cases the average of duplicate results was around 10%. F i g u r e 7 A v e r a g e P r e c i s i o n 5. Related Work Some significant work has been developed on semantic portals. KA2  offers a complete infrastructure providing resources, methodology and tools for ontology development especially designed to be used by heterogeneous research communities, geographically distributed. The KA2 portal  is a special component of this environment. It provides an ontology view of the knowledge acquisition community. Besides of semantic retrieval, it allows comprehensive means for navigating and querying the knowledge base, and also includes guidelines for building such a knowledge portal. The potential users provide knowledge by annotating their Web pages in a decentralized manner. The knowledge is collected at the portal by crawling and presented to the user in different ways. SEAL (SEmantic portal)  is a generic approach for developing semantic portals. It exploits semantics for constructing and maintaining a portal, as well as providing information access at it. The knowledge base is represented in F-Logic. 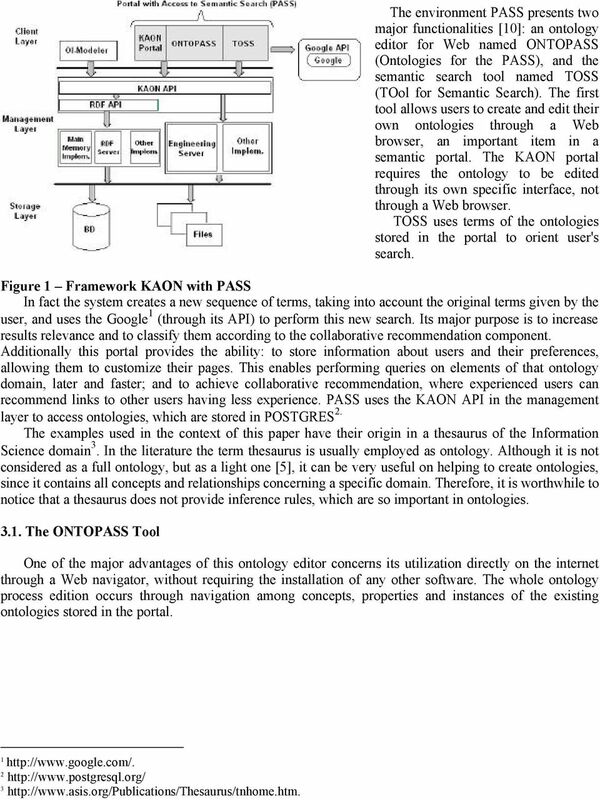 The KAON Portal  is also an important initiative in the context of semantic portals, as described in section 3. It is a component of KAON framework and it acts as a simple tool for generating ontologybased Web portals. In order to create the portal, users need to create an ontology containing the information that will be presented in the Web. The KAON Portal may then be used to provide default visualization and navigation through this ontology. Our work benefits from the KAON infrastructure, and it extends some of its functionalities in order to provide semantic search on the Web using a traditional and efficient search engine. In this context it exploits some other features that are found in SEAL, such as personalization views and establishes a collaborative recommendation mechanism, not found in these systems. Finally, another relevant contribution involved measuring the efficacy of using ontology to contextualize the arguments provided by the user during a search on the Web, increasing results relevance. 10 6. 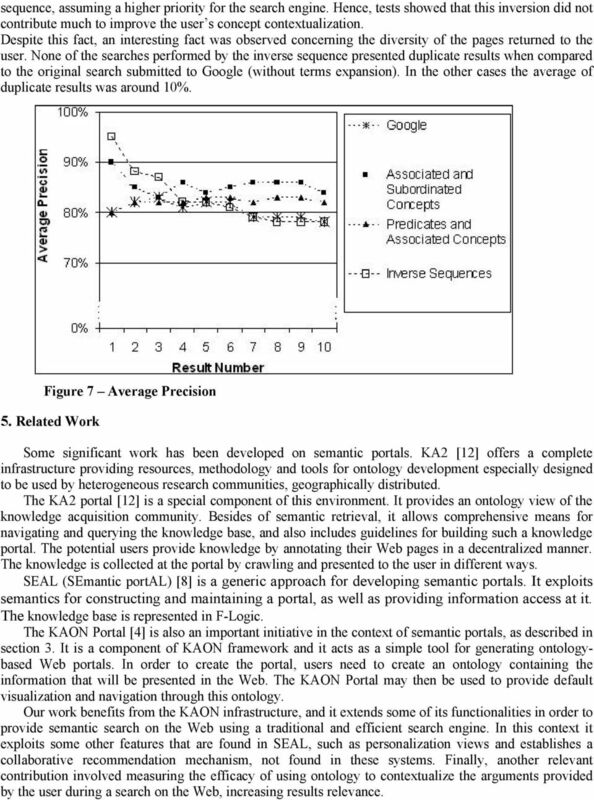 Conclusion This work described the PASS environment, extended from the KAON portal, whose main purpose is to show how the use of ontologies can improve relevance of the results returned by a search engine on the Web. PASS is composed of two important modules: ONTOPASS, responsible for the ontology creation, edition and navigation; and TOSS, whose main function is to expand user s search terms according to a domain ontology stored in the system, to contextualize the search. In order to show the efficacy of ontology use during the Web search process, we have done a comparative analysis of the results returned by the search engine using terms expansion from a domain ontology and not using them. This evaluation showed that when using approaches such as associated and subordinated concepts, as well as associated predicates, results relevance improves significantly, and hence its executions are worthwhile. We are now working on the ONTOPASS tool in order to provide ontology import and a configuration strategy to enable its evolution. We also intend to improve the collaborative recommendation filter in PASS, in order to encourage communities of practice willing to share documents and relevant links in a certain domain on the Web. R e f e r e n c e s 1. R. Baeza-Yates, B. Ribeiro-Neto, Modern Information Retrieval, Addison Wesley, New York, NY, USA, J. Barker. Google - the BEST Search Engine, UC Berkeley - Teaching Library Internet Workshops, T. Berners-Lee, J. Hendler, O. Lassila. The Semantic Web, in Scientific American, May E. Bozsak, et. al. KAON - Towards a Large Scale Semantic Web, Proc. of the 3rd Intl. Conf. on E- Commerce and Web Technologies (EC-Web 2002), 2002, pp O. Corcho, et al. Methodologies, Tools and Languages for Building Ontologies. Where is Their Meeting Point?, Data & Knowledge Engineering,46, 2003, pp J. M. Kleinberg. Authoritative Sources in a Hyperlinked Environment. Proc. of the 9th ACM-SIAM Symposium on Discrete Algorithms, 1998, pp A. Maedche, S. Staab, N.Stojanovic, R. Studer, Y. 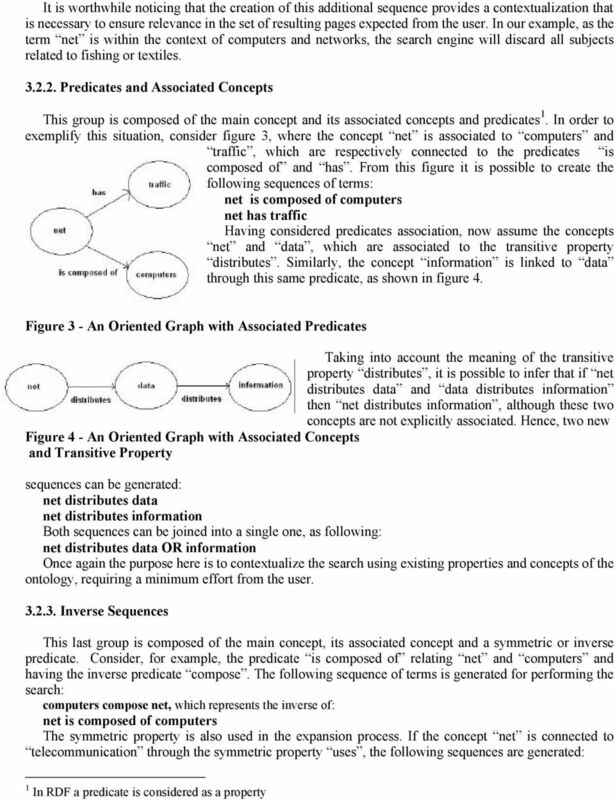 Sure, A Framework for Developing Semantic Web Portals, Lecture Notes in Computer Science, v. 2097, A. Maedche, et al. SEmantic portal - The SEAL Approach, in Creating the Semantic Web, D. Fensel, J. Hendler, H. Lieberman, W. Wahlster (eds. ), MIT Press, MA, Cambridge, L. Page, S. Brin, R. Motwani, T. Winograd, The PageRank Citation Ranking: Bringing Order to the Web, Stanford Digital Libraries Working Paper, W. A. Pinheiro. 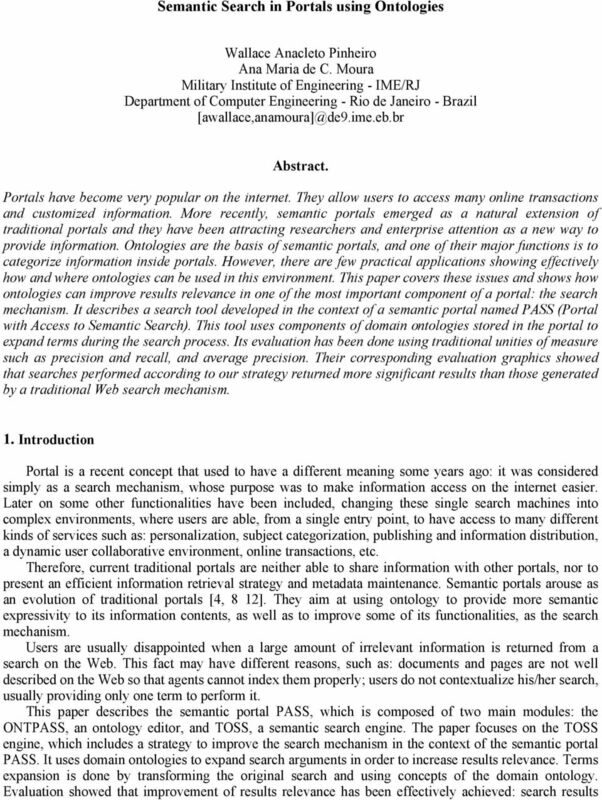 Search in Semantic Portals: an Ontology-Based Approach (in Portuguese), Master Thesis, IME, Feb RDF. Resource Description Framework (RDF) Model and Syntax Specification, 1999, Available at: S. Staab, et al. Semantic Community Web Portals, 2000, in WWW9 / Computer Networks (Special Issue: WWW9 - Proceedings of the 9th International World Wide Web Conference, Amsterdam, The Netherlands, Maio, 15-19, 2000). Taxonomy Strategies November 28, 2012 Copyright 2012 Taxonomy Strategies. All rights reserved. The Value of Taxonomy Management Research Results Joseph A Busch, Principal What does taxonomy do for search? Improving information retrieval effectiveness by using domain knowledge stored in ontologies Gábor Nagypál FZI Research Center for Information Technologies at the University of Karlsruhe Haid-und-Neu-Str.